A few years ago I started collecting different varieties of hen and chicks (Sempervivum). I think I took interest in them because I had already planted the “big stuff” like bushes and trees, as well as all kinds of perennials on my property, and I have a strip of crushed stone behind my house that needed decorating; so hen and chicks I thought would do good there. After buying my first few hen and chicks (sembervivum) I quickly found out their likes and dislikes. Sempervivum like sun. Hen and chicks don’t need or probably even want fertile soil to grow in, and above all else don’t want, like or need too much water. Over watering is the number one way to kill them; I learned that the hard way. Years ago I bought an expensive and quite oddly beautiful sempervivum at the White Flower Farm in Litchfield, Ct. I got it home, planted it up in good soil, gave it a good drink and a week later it had died. The plant was perfectly healthy when I bought it, but too much of my “Tender Loving Care” killed it. I now know less is more when it pertains to hen and chicks, as they don’t know when to stop taking in water, which over hydrates the plant, which brings on its demise. 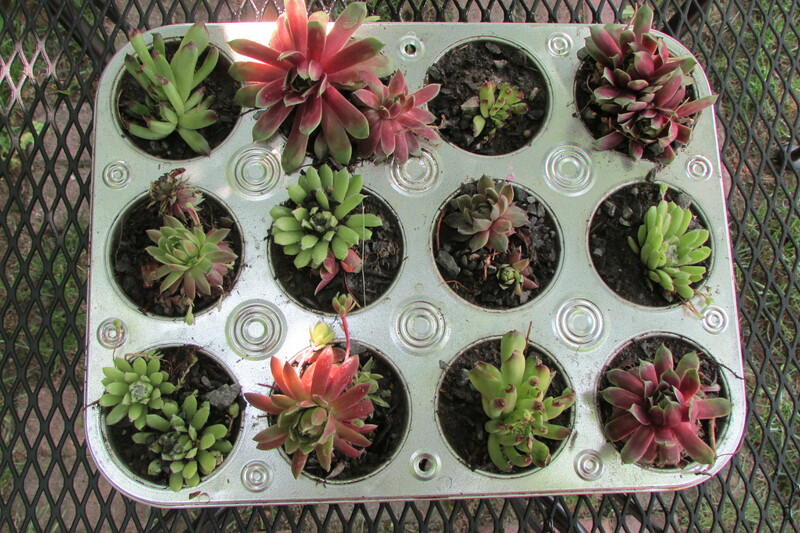 This post is about planting up hens and chicks in cupcake, muffin or popover tins, here is how I planted up mine. Materials needed to do the project..
1 or more cupcake, muffin or popover pans. New pans are available in the cooking department at retail stores, and for not much money used pans are available at the Salvation Army, garage, tag or estate sales. (8 compartment pans and popover pans might have larger spaces for planting than 12 compartment pans) (look for a pan with a rust proof coating, otherwise your tray will start turning rust colored after a week or two, when left outside). Step 1..Wearing safety glasses and working outdoors or in a well ventilated places, place the piece of wood or 2×4 on a solid level surface like a patio or garage floor. Step 2.. Turn the cupcake, muffin or popover tray upside down and position it so any of its compartments are directly over the piece of wood. Working on the backside of the tray, drill 3 or 4 drainage holes in each compartment. As you pierce the metal tray your drill bit will land in/hit the piece of wood. When I drilled mine, there was a bit of a burning smell as the drill cut through the metal tray. Step 3.. Cut a square of landscape fabric, screen or even burlap to fit the bottom of each muffin cup; that will keep the soil from washing out when you occasionally water the plants. Step 4.. Assemble an assortment of different colors, shapes and sizes of sempervivum that you have separated from larger plants that came from your garden, or you picked up at the garden center. Smaller specimens and individual pieces are easiest to plant up. Step 5.. Do a dry run. 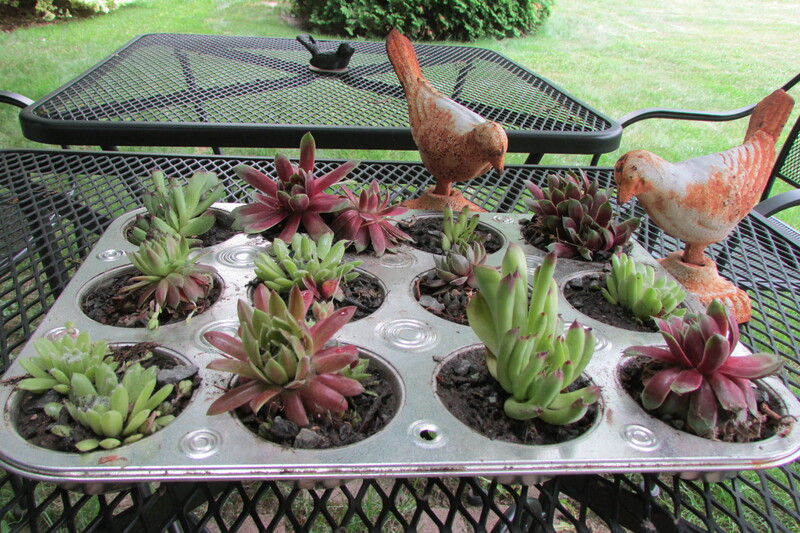 Practice layout your hens and chicks in the individual compartments until you come up with an arrangement that you like. In my tray, I tried to alternate red and green ones in different rows; I also using at least two of each variety of plant so there would be a repetition of shapes, colors and sizes. Step 6.. Mix together your gardening soil and small crushed stone (as I did), or soil and sand, or soil and gravel. Do a 60/40 mix of soil to stone, etc or a 50/50 blend. The planting medium, in a way, is just there to anchor / hold the plant in place. The planting medium should drain quickly so the sempervivum does not have too much time to drink too much water. (around my house, I have hen and chicks growing directly in just crushed stones and in-between small stone that are along the foundation of my house). Step 7.. After deciding what plants will finally inhabit each compartment, take your planting medium and gently work it in and around each of your hen and chicks to fill the cup. When you have planted up all the compartments, take an old water color paint brush or an old makeup brush and brush away any excess soil that is on your tray. Step 8.. Water your plants. If needed take a wet paper towel and clean up any soil that dirtied the top of your tray after your first watering. Siting your tray of Sempervivum.. When picking a place to display your hen and chicks creation, pick a place that gets sun. Just don’t locate it in a place that gets strong, beating down, hot sun at the hottest part of the day. Sempervivum are mountain plants, not desert dwellers. They might be able to be in full sun up on a mountain, but there are also mountain winds blowing that keep them cool and from drying out. I have sited mine on the east side of my house, by the front porch, with other potted things, My tray gets full sun in the morning, and by afternoon it is shaded by the house. Overwintering your tray of Hen and Chicks.. If you live in a cold climate as I do (zone 5-4 (-20 to -30 degrees below zero), when Winter comes place your tray in a sheltered location out of the way of strong, cold and drying winds. Place the tray up against the foundation of your house, or possibly in-between foundation plants. You could also bury the pan (with hen and chicks exposed) in a place like a vegetable patch. If you don’t bury your tray, pile a lot of leaves around it to insulate the plant’s roots. (I have a miniature cast iron planter by my front door planted with sempervivum. They are protected by the house. I pour water on them once in a while during Winter and they have survived our winters for 2 years). Al Fresco (Outdoor) Dining.. Two cafe/bistro-patio tables equal one Picnic Table 5-22-2012. This entry was posted in Roses, Peonies, Tulips, etc, The Spring Garden. Bookmark the permalink. This is adorable. I think I need some of these in front of my brick wall that divides my yard from the street. It’s due south and of course, it only gets what water nature provides. I currently have black-eyed susans, campsis, daylillies and mint as well as two cornus mas and it’s still not enough!